Ecormon - Kenya Biologics Ltd.
ECORMON is formulated with a seaweed extract, which contains natural plant hormones like auxins, cytokinins, and gibberellins. These compounds act as plant growth regulators in very small concentrations. They promote development of plant roots and buds, speed up cell division processes, stimulate photosynthesis, delay senescence and reduce premature dropping of fruits. ECORMON also contains molybdenum and amino acids to enhance absorption and translocation within plant tissues. Molybdenum is used by nitrate reductase enzymes present in root and stems, which control reduction of nitrate to nitrite ion. Molybdenum also facilitates iron absorption. Application of ECORMON increases pollen production, improving the development of fruits. ECORMON is recommended to prevent and correct molybdenum deficiencies and stimulate growth in vegetables and fruit crops. Use in foliar spraying or diluted in irrigation water. Apply at two to three week intervals using sufficient water to ensure coverage. ECORMON is stable for at least three years since manufacturing date. Store in the closed original container in a cool, well ventilated area. DO NOT store for prolonged periods in direct sunlight. Keep away from food, drink and animal feedingstuffs. Keep out of the reach of children. 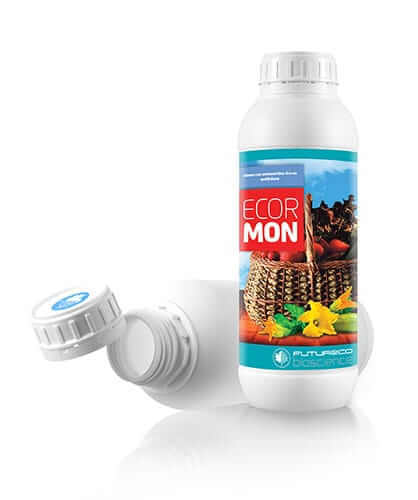 ECORMON is highly compatible with most pesticides and fertilizers. For application with plant protection products follow pesticide label directions and make jar test for compatibility. Composition is subject to change according to the local regulations of such products. Zucchini 0,5 – 1 0.4-0.7 3-4 Apply every 5-7 days since emerging of the leaves. Cucumber, melon, watermelon 1 – 2 0.4-0.7 2-3 Apply at 15-20 days intervals since enough foliar mass development. Pepper, tomato 2-3 0.4 – 0.7 2-3 Apply at 15-20 days intervals since a minimum foliage development. Lettuce, cauliflower 2 0.5 – 1 1 Apply every 5-7 days after transplantation. Strawberry 1 – 1.5 0.5 – 1 3-4 Apply every 15 days from preflowering. Citrics — 0.3 – 0.5 3 Apply from preflowering to fattening. Pome and stone fruits — 0.3 – 0.5 3 Apply from preflowering to fattening. Olive tree — 0.4 – 0.7 3 Apply from preflowering to fattening. Grapevine — 0.5 – 1 2 Apply since beginning of veraison. Subtropical (papaya, avocado) 1.5 – 2.5 1 – 2 3 Apply from preflowering to fattening until fruit formation. Legumes 1 – 1.5 0.4 – 0.7 2 Apply since first leaves development. Ornamentals (flowers) — 0.3 – 0.5 2-3 Distribute application throughout crop cycle.